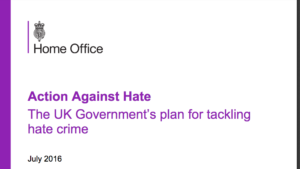 Earlier this week Lord Singh contributed to a debate following a motion tabled by minister Lord Bourne, ‘That this House takes note of the challenges posed by religious intolerance and prejudice in the United Kingdom.’ The debate coincided with the launch of the government’s ‘refresh’ of Action Against Hate (2016) their four-year hate crime plan. During the debate Lord Morrow (DUP) independently referred to Hardeep Singh’s efforts (our Deputy-Director) in unearthing FOI data from the MET police (2015/16) which showed significant numbers of non-Muslims and those of no recorded faith, are recorded as being victim of ‘Islamophobic hate crime’. I read the Government’s half-time review of their hate crime strategy and find it disappointing in that it completely fails to address the underlying causes of hate crime—for much of this evening, we have done the same—and, while repeatedly addressing the concerns of the Abrahamic faiths, virtually ignores the equally real suffering of other faiths. The review details some 20 initiatives to protect against anti-Semitic and Islamophobic hate crimes. A condescending reference to occasional round-table meetings with other faiths is no substitute for action. Why the disparity? To echo Shakespeare: if we are cut, do we not bleed? There are no comparative statistics on hate crimes suffered by different religions to justify partiality. Figures presented to justify additional resources for the Jewish and Islamic faiths come from those communities. Chief Superintendent Dave Stringer of the Met has made it clear that a significant proportion of hate crime recorded as Islamophobic is against other communities. The noble Lord, Lord Morrow, referred to a freedom of information request made by my colleague, Hardeep Singh, which showed that there is no clear definition of whom hate crime is committed against. Many of the hate crimes described as Islamophobic are directed against Sikhs out of ignorance or mistaken identity. In the States, a Sikh was the first person murdered in reprisal after 9/11, and six worshippers in a gurdwara there were shot by a white supremacist in another mistaken-identity killing. The day after 9/11, I was going to a meeting with the then CRE at Victoria. As I came out of the station, two workmen digging the road looked at me in a hostile way. Fortunately, their lack of religious literacy saved the day. The elder turned to the younger and said: “He’s not a Muslim; he’s a Hindu.” I did not argue the point. Few Sikhs have not been called “bin Laden” at some time or other, and some have been violently attacked. We heard about the gurdwara in Leeds being defaced and partly burned and, only a couple of months ago, a gurdwara in Edinburgh that I had recently visited was firebombed. I do not in any way begrudge the protection that Jews and Muslims receive against hate crime. The Jewish community has suffered grievously from anti-Semitism, and Muslims are suffering hate crime today. I have always had a warm working relationship with both communities. All I ask is that the Government are a little more even-handed to non-Abrahamic faiths in both policies and resourcing. Today, the one-time distant foreigner, with a different culture and religion, can be our next-door neighbour, and it is imperative that we set aside our own prejudices and see people as they really are, equal members of one human family. This bigotry of belief is widespread and is often found in religious texts. As a Sikh, I feel that the ultimate blasphemy is to say that texts condoning the killing or ill-treatment of the innocent are the word of God. Such beliefs lead to horrendous crimes and savagery—not only between faiths, but even within the same faith—and to increasingly familiar terrorist outrages in the name of religion. It is important to understand that religious extremists and far-right extremists need each other to thrive. Today, despite all the lip service paid to interfaith understanding, there is virtually no dialogue between faiths to explore and understand their different religious teachings, with each remaining smug in its beliefs. I have been a member of the government-funded Inter Faith Network of the UK since it was founded in 1987 and am a member of other bodies committed to religious dialogue. Meetings rarely go beyond pious statements and academic discussions on safe peripheral concerns, with members going back to their congregations to stress the exclusivity and superiority of their teachings. Looking at an internet learning site about Islam, I was startled to see a colleague saying that he felt sorry for people of other faiths because they were “all going to hell”. I once attended a meeting of the Three Faiths Forum where Christians, Jews and Muslims were talking in a superior way about the three monotheistic faiths. According to the opening line of the Sikh scriptures, there is one God of all humanity. We need to learn a little more about each other to combat religious prejudice. It is not all up to the Government. People of religion have a common responsibility to look afresh at negative cultural practices such as discrimination against women and others that attach themselves to religion. Religion will become more relevant if we separate dated culture from abiding ethical teachings. Secular society, which sometimes shows an aloof superiority to warring religions, should also encourage more open dialogue. With the best of intentions, we skirt around questionable beliefs and practices by using coded camouflage words to address symptoms, rather than looking to the underlying causes of violence and hatred. Words such as “Islamist”—insulting to Muslims—“radicalised”, “extremist” or “fundamentalist” are loaded ​euphemisms or vague innuendos, devoid of real meaning. The absurdity of such language is illustrated by the true story of a visit to my home by two Scotland Yard officers following my criticism of the Indian Government’s involvement in mob violence against Sikhs. The men from the Yard asked if I was an extremist or a moderate. I replied that I was extremely moderate. They then asked if I was a fundamentalist. I replied, “Well, I believe in the fundamentals of Sikh teaching, such as the equality of all human beings, gender equality and concern for the less fortunate. Yes, I suppose I am a fundamentalist”.